Fans, when we first briefed you on this Bigfoot ebay item we were certain Clifford LaBrecque was trying to cash in on a 30 year investment, and we doubted if Clifford knew how auctions worked. When we saw the item has recently been re-listed for $5000 more, upping the price to $85,000, we knew we had to call Mr. LaBrecque to get the details. “You can’t make a replica like that today for less than $85,000.” LaBrecque said over the phone. Based on what we know about costumes he may be correct. The Hairy and the Hendersons costume cost several million in 1985, adjusted for inflation it is about $3.9M in today’s dollars. Granted, Hairy Henderson had remote control animatronics, but even a Hollywood costume without fancy electronic moving parts would run a quarter to a million dollars today, if it were made by a special effects studio. As we continued to speak to Clifford Labrecque we realized there really wasn’t a price too big for this statue. Read the rest at Bigfoot Lunch Club. Psychology reduces to biology, all biology to chemistry, chemistry to physics, and finally physics to mathematical logic. Guy Edwards is host of the Portland, OR event HopsSquatch.com. This entry was posted on Monday, July 30th, 2012 at 6:01 pm and is filed under Bigfoot, Bigfoot Lunch Club, Replica Cryptia, Sasquatch. You can follow responses via our RSS 2.0 feed. You can skip to the end and leave a response. Pinging is not allowed. I’m waiting till it hits a hundred thousand to not buy it. Hey, thought I would put the house up for sale, then I thought id kinda live in the statue, be kinda stuffy, but id get over it, but going to the bathroom would be a drag…..
Do ya think I could even sell me house? I think you guys should all chip in some money each and buy it for the ICM….. But does anyone know definitely and unequivocally what a sasquatch’s head is supposed to “look like” (just my probably worthless AU$0.05 worth)? 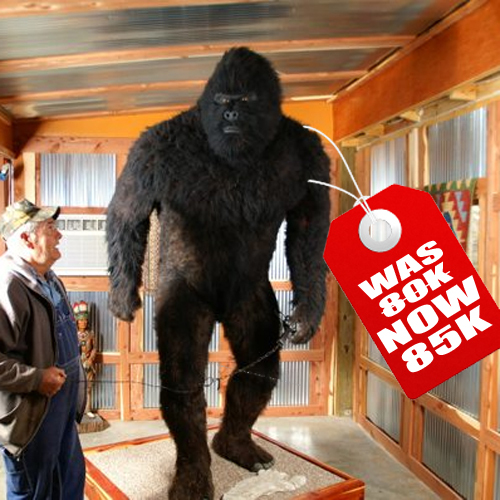 I do a lot of fantasy taxidermy art and I will state firmly that I could produce that piece for under 10k. 85K is absurd. There is huge difference between producing a static prop, and a complicated animatronic costume that must hold up to movement. On a static piece there is no need to hand layer or punch hair, which drives up the payroll hours on suitwork. The facial sculpting is basically obscured by the hairwork, though I’ll grant the hands are rather nice.